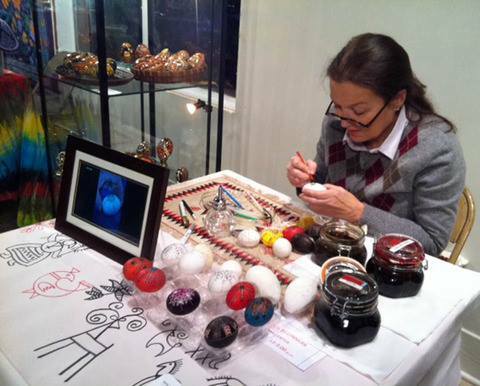 This video is from my own YouTube channel Pysanky Basics. 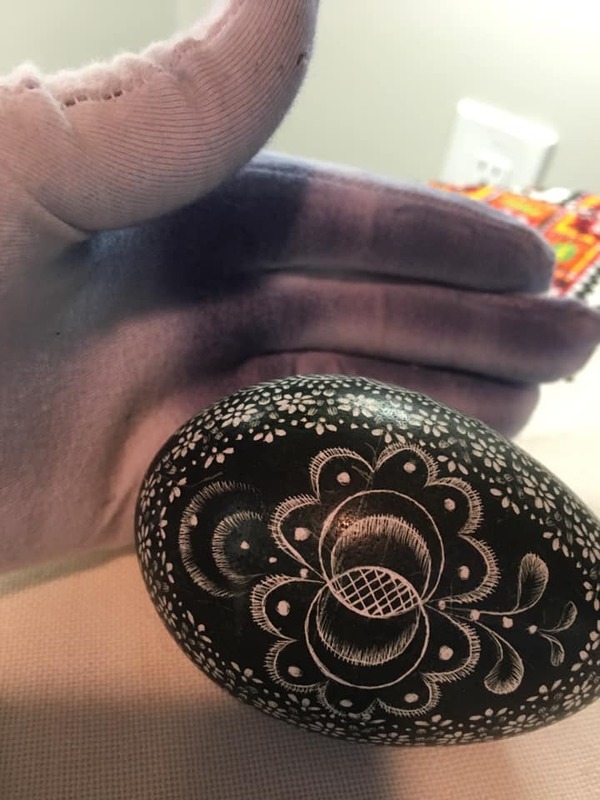 It's a quick reminder to keep working on a pysanky even if you are not at first, pleased with it. 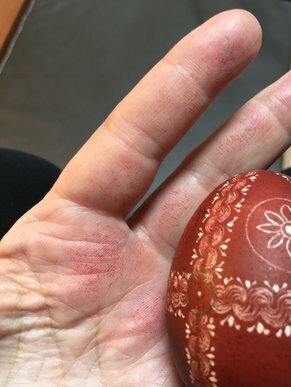 To prevent dye from accumulating on your hands while working on Kroszonki, the Polish scratch method of Pisanki-I use a glove on the hand that holds the shell. I also wear a glove, as you can see below, when working with a kistka. 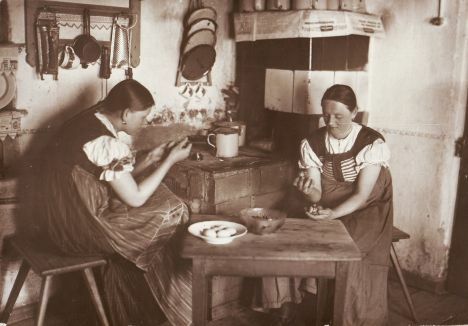 "The tradition of making an Easter scoop in Opole Silesia has its documented pedigree and is derived from the early 13th century. However, it is widespread throughout Central and Eastern Europe. Archaeological findings in Opole Ostrówek indicate even the tenth century. Easter egg in Opole Silesia in its present form spread in the eighteenth and nineteenth centuries. 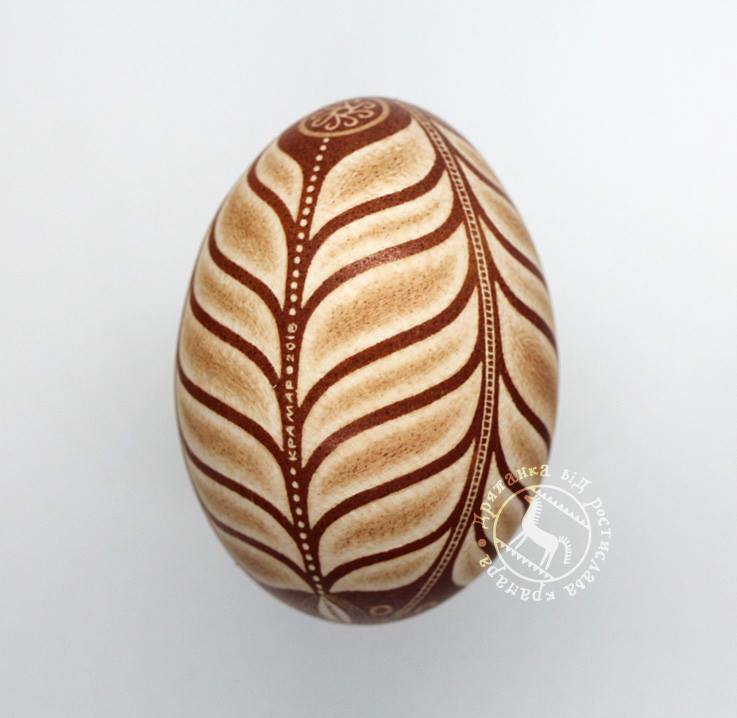 They were first of all decorated with the batik method, it is an egg painted with hot wax and then dyed. This method is still widely used in the vicinity of Tułowice and Korfantowa. However, a typical Silesian leaflet is a product from the turn of the 19th and 20th centuries. 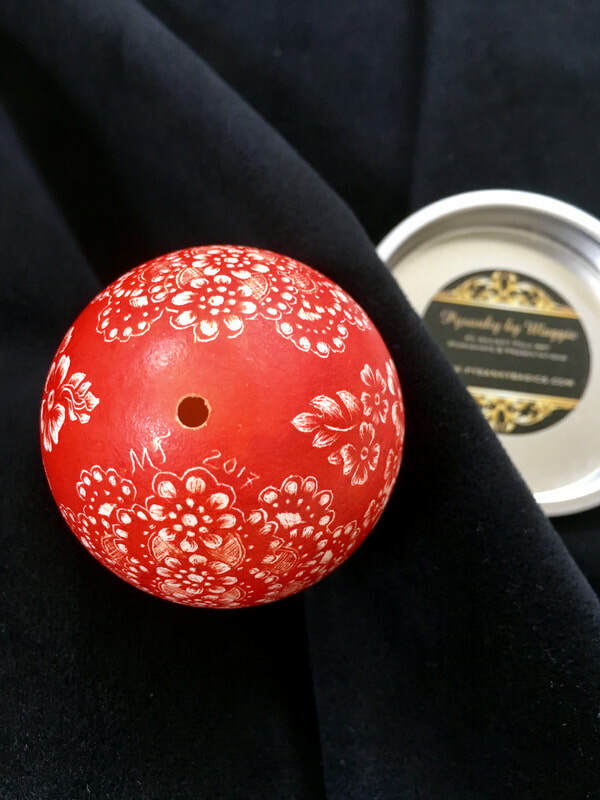 The dyed egg is decorated with the engraving method (scratched), decorated with traditional floral ornaments: palm trees, flowers, leaves, whose patterns are also often found in embroidered tablecloths, curtains, decorative bedding (kapach), costumes and folk painting. The variety of patterns that are applied to the surface of the brochures depends on the artistic creativity of the creator himself. In the mid-twentieth century large clear patterns were scraped on the eggs. 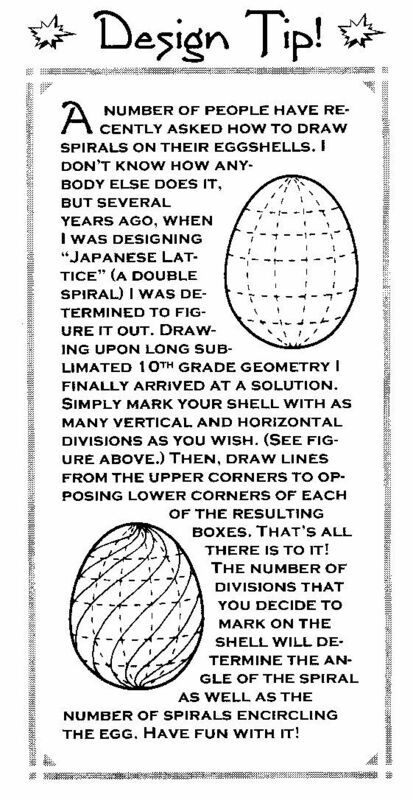 In the eighties, the large pattern is more and more filled, supplemented with small additions. Patterns from this period are considered by most creators to be the traditional pattern of Opole kroszonki.Shades of brown dominate the color (staining with onion shells). This booklet has its own unique charm and the composition is clear and legible, in the depicted image there is clearly noticeable depth and subsequent layers of the presented pattern. Another very extensive element are symmetrically placed very rich lines and the real art is that they would be perfectly straight and equal in size and shape of individual, subsequent elements. In addition, Gertruda Matej, Anna Skrzypczyk, Emilia Suchy, Maria Flak, Maria Kobyłka, Anna Mitko, Maria Kuczber, Piotr Wysada, and Stefania Topola. The young generation is also worthily replacing their masters. We include such people as Agnieszka Gryc from Szczedrzyk, Patryk Blania from Obrowiec, Edeltraud Kroppop, Łucja Mandelka, Edeltraud Fornal, Kornelia Gabrielczyk, Gertrud Kleman, Małgorzata Mateja, Maria Żmija-Glombik, Renata Janik, Maria Rudzik, Elżbieta Pazur, Maria Cichoń , Ewa Hurek, Aneta Hurek, Sabina Karwat, Dominika Kunicka, Justyna Langner, Wioleta Obrzud, Agnieszka Okos, Sonia Ozimek, Natalia Patryek, Sonia Sappok." Back in February, at Katy’s Pysanky Day, Shannon and Kim showed an idea for checking blank shells for fractures and weakness! I shot these photos on my iPhone so you can see it is brilliant idea! Select each shell and place it over the light on the phone, as seen in these photos I took of Kim holding each shell in place for examination! THANK YOU SHANNON & KIM for letting me post this excellent idea. KIM HOLDS THE EMPTY SHELL OVER THE LED FLASHPOINT, TO EXAMINE IT FOR FLAWS. LOOK CLOSELY AT THE BASE OF THIS SHELL..I would not risk using this shell. Would you? THIS SHELL SHOW SPECKLES AT THE BASE...I WOULD USE IT...would you? 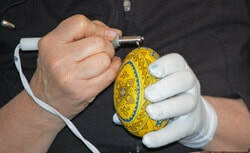 IN MY Pysanky Demonstration & Display I use a digital picture frame, that continuously loops photos step-by-step, of the procedure from marking off a shell, to dying and up to wax removal. It saves a lot on repeating a process explanation to the visitors. This also keeps you freed up to help people, who want to make purchases. Here is a picture of me with the digital picture frame on my table. With a digital frame, you can create many of these looped slides shows for people to view; and thus, answer questions to even a different process, like Lemko Drop Pull. The photo here shows my demo set-up, egg display; you see the digital frame is up front and to my left. I have been using a tablet for the past year at all my events, with about a 2 hour playlist of photos, unwaxing, writing, etc. 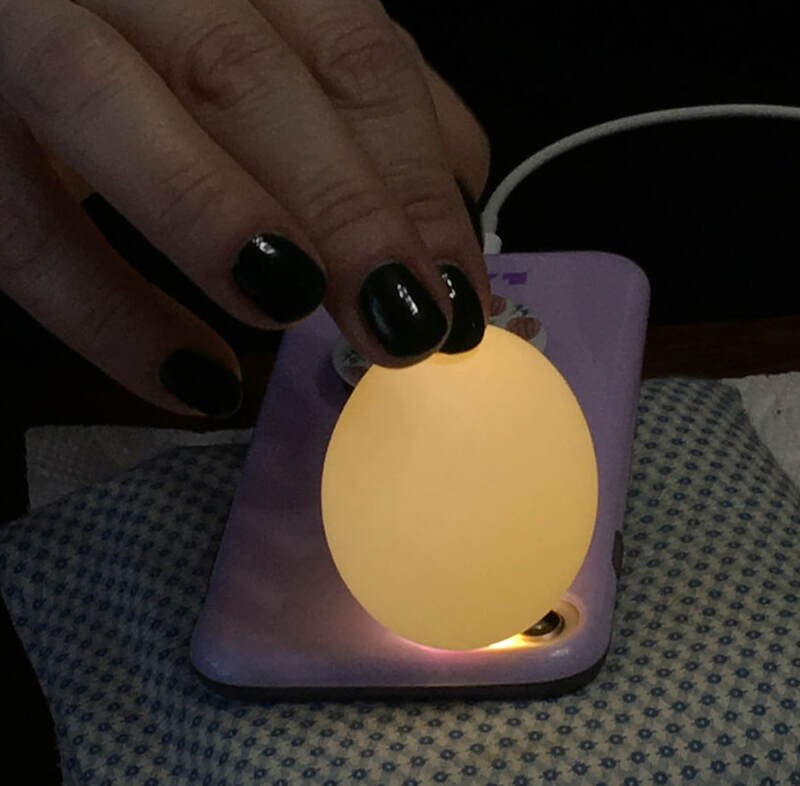 15 cm square, best size paper for chicken eggs. Mod Podge glue and spray varnish(optional). 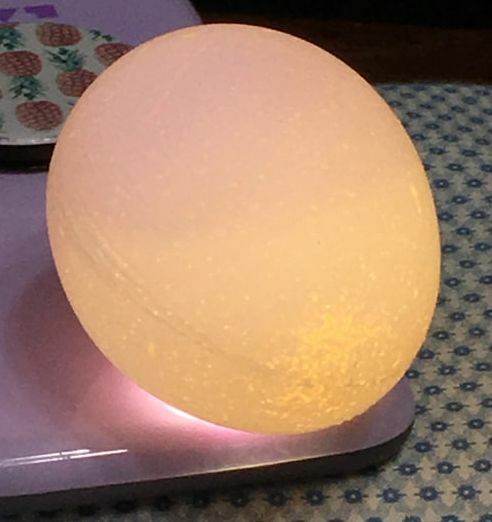 A Washi egg is made by first blowing the egg to remove its contents, as for any egg shell art. Washi paper arrives as a square. A rectangle of the washi paper is measured out 9 cm width and 15 cm in length. ​See the illustration below for final measuring. Each strip is trimmed to a point. 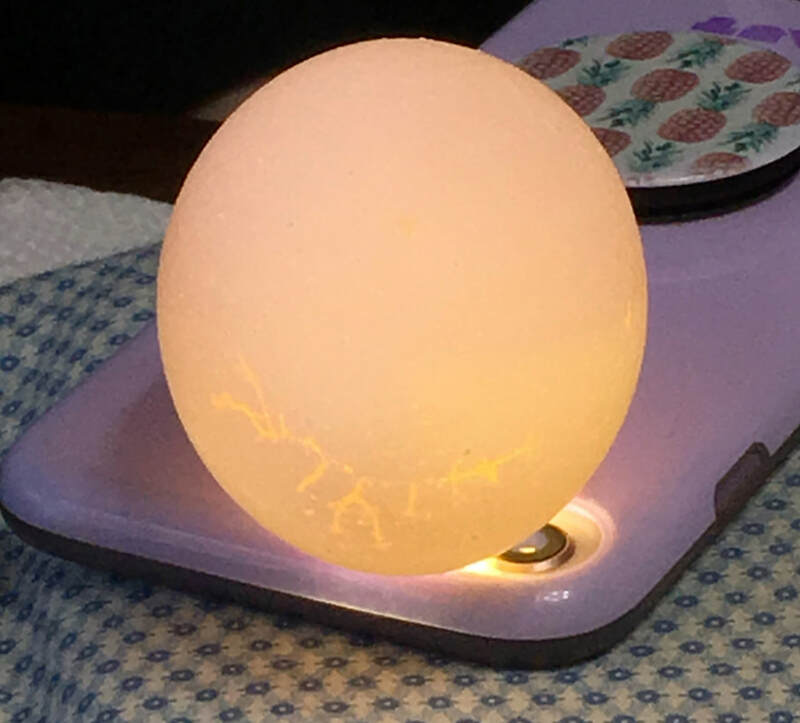 the strips overlap at the ends of the egg. The egg may then be varnished. I don't varnish, because I find the Mod Podge, creates a nice patina. This first Dryapanka egg is made by Rostislav Kramar, of Ternopil, UA. Click on the image to see how he signed and dated this piece. This first Dryapanka egg is made by Rostislav Kramar, of Ternopil, UA. Look closely to see how he signed and dated this piece. Click on the image. In the 'Goody Bag' 2017, at the Pysanky USA Retreat in Wilkes Barre, Pa., Hazel Keys added a brilliant idea!